I can now reveal where I was heading with my previous CSS Gradients demos. I imagined a simple house shaded using these gradients. Of course when I finished, the house was a lot more detailed than I had imagined. I used PHP to generate the divs and the CSS, which allowed me to create a function to generate a gradient box anywhere on screen. It was then a matter of calling this function again and again to build up the picture. Each time I was able to define the positioning and colours of the gradients. To top it off I added a second function to create a sloped gradient. 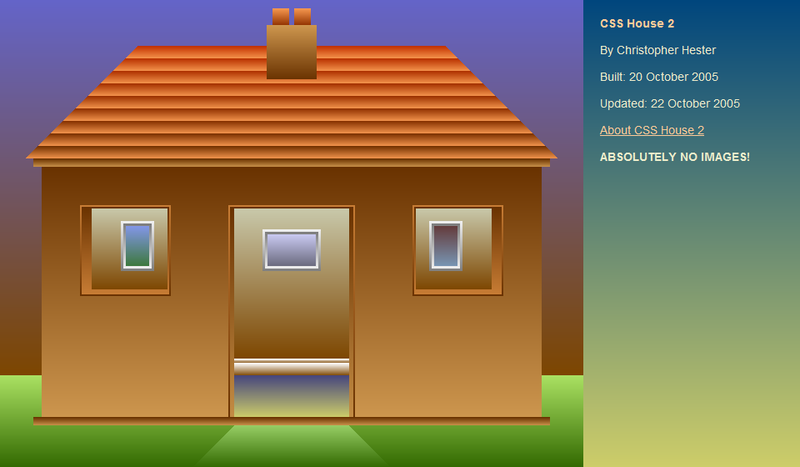 I hope people like it as much as my previous CSS House demo. If I get half the worldwide interest that generated, I'll be more than happy. Let me know if it works in any other browsers! Here's a screenshot to show how it should look. Added a screenshot so you can tell if your browser isn't displaying it properly. Improved the speed of the demo by caching the PHP as a static HTML file. Also removed some redundant spacing. The file would be 28Kb smaller if it weren't for the comments required inside each div, purely there to make IE6 play ball. The demo currently stands at 212Kb, using over 3,595 divs! Subscribe for testking 70-620 training to help you pass exam on time! testking also provides best quality testking RH302 dumps and testking 646-363 practice exam. Well that's quite the elaborate image you've got there. All of those divs take quite a while to display in my browser (creating an interesting top-down incremental loading effect for each block of divs, and thus showing the source order of each house component) but they certainly create a pretty nice image in the end. I see you've replaced the class system you had been using with an inline style attribute, which makes sense and reduces some of the code bloat. There seem to be some problems though, as the windows and door don't quite look right (the interior areas I assume are supposed to be the interior of the house but this isn't apparent and the window and door frames aren't very clear) and your gratuitous use of gradients doesn't seem to be necessary in some places (although you've probably just done this for illustrative purposes). The house seems like it could use some depth in places as well. Overall, your use of the CSS Gradients in a real world situation has been pulled off quite nicely, unfortunately the file size is rather large at ~200kb and therefore this isn't really a practical solution. But as an interesting proof-of-concept, I like it. Works in Firefox Beta 2, although it took a bit longer to render than in 1.0.7 for some reason. Really cool! Works great in my Firefox 1.0.7. - Mozilla Firefox 1.0.7 - Perfect! - Opera 8.5 - Perfect! - Konqueror 3.3.2 - Perfect! Impressive like a guy who builds an entire (real) house out of old bottle-caps or something. Kind of crazy, not the sort of thing that I would necessarily do, but darned impressive. I like the fact that the chimney is attached to ... nothing.